AxisTV Design provides an intuitive, powerful design environment for creating messages, templates and screen layouts with ease. This robust application lets you place design elements exactly where you want them with time-saving tools that make it simple to build stunning content to capture your audience’s attention. AxisTV Design widgets let you quickly place backgrounds, text, graphics, videos, streams, and webpages in your digital signage layouts. And you can use our handy data widgets to map dynamic data for events, weather, RSS and more. Because AxisTV Design runs on the desktop, designers can create content offline when they need to, and synchronize with the CMS once they’re connected to the network. Use our drag-and-drop desktop design tools to create stunning layouts, messages and templates – then sync your creations with the central CMS. You can manage your digital signage players and assets from any web browser for fast, easy updates. Show event schedules from calendar apps. Publish Excel and XML data to templates. Include current news, social and RSS feeds. Display webpages and SharePoint. Share real-time dashboards and maps. Use friendly, drag-and-drop design tools. Import graphics, videos, PowerPoint and more. Create templates for quick message design. Include interactive hot spots for kiosking. Design offline and sync at your convenience. Show news-in-pictures for selected categories. Display five-day forecasts and current weather. Present financial market data and stock info. Highlight social media feeds and posts. Share community calendars, health tips, sports and quotes. Q. 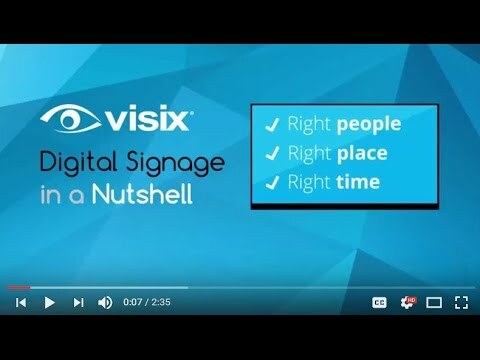 Why do I need a digital signage software? Digital signage not only informs and engages more people through creative presentation, but also reaches them instantly and reliably – and messages can be updated or retired in real-time. It is a modern approach to corporate communications that draws in viewers with bright, animated graphics and interactivity. Q. What is the advantage of web-based over native applications? We believe in making digital signage as easy as possible for our clients. One of the ways we do this is by providing browser-based software. This means that our content management software lives on one machine that’s on your network or the web so that more people can access it for faster, easier communications. Q. Can I use digital signagefor alert notification? Yes, Visix software supports CAP-compliant alert triggers. Our digital signage software alert modules allow for manual alert overrides using the software interface and provides three ways that integrated third-party systems can automatically trigger your alert notices – by posting CAP (Common Alerting Protocol) messages to an content manager, by communicating with the available API, or by sending emails to the content manager. These external systems can include mass notification and text messaging services, emergency notification systems, public address systems, and others. Q. How long will it take me to learn to use the system? After just two hours of online training, you’ll be able to create, import and schedule content and manage your media libraries and playlists. Another two hours shows you how to create beautiful templates and layouts, and our final two hours of standardized training teaches you how to create user roles, configure system settings and perform other administrative tasks. That’s less than one work day to learn our software!